When you’re heading off on a rural clinical placement, nothing beats local knowledge. Monash Rural Health has been embedded in rural communities for over 25 years, so we know our regions inside out. Our doors are open to all medicine, nursing and allied health students and we’re very happy to share what we know. Looking after yourself on placement is also important. The National Rural Health Student Network (NRHSN) produces a guide to mental health: When the cowpat hits the windmill: a guide to staying mentally fit. Looking for someone at each training site to talk to? Here's who can help. Come in and ask for them or contact by phone or email. We also know what’s happening outside work times when you need a break from studying. Student social events, local sporting clubs and activities, the safest cycling or running routes, the best place to find coffee ... just ask. Drop into one of our teaching sites and introduce yourself to our staff. We’re looking forward to meeting you. WILDFIRE is Monash University's rural and indigenous health student club and is open to all medical, nursing and allied health students interested in rural health. The club has subcommittees at Clayton, Parkville and Peninsula campauses; and Bendigo, Churchill, East Gippsland, Gippsland and Mildura teaching sites. See the Monash Rural Health accommodation webpage for details and contacts at each site. Need to stay in another part of Victoria? If your placement is outside the Monash Rural Health footprint, you can find other University Departments of Rural Health that can help you on the Australian Rural Health Education Network (AHREN) website. Need someone to talk to about personal, social or academic problems while you're studying? 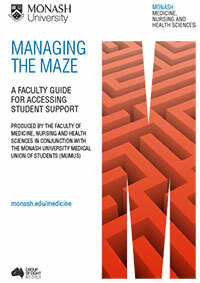 Download the guide to accessing student support. If you need financial help to go on a clinical placement, you can apply for a Monash Practical Placement Bursary. Student loans and emergency grants are also available to eligible students. Monash also offers support if you're heading overseas for a placement. RWAV (Rural Workforce Agency) Victoria offers grants of up to $2000 to help medicine, nursing and allied health students to do placements in regional or rural Victoria. Look under Future Workforce Grants for guidelines and an application form. The Going Rural Health Student Support Scheme can help you with up to $200 per week towards the cost of accommodation and travel when you're doing a rural clinical placement. The scheme is administered by the University of Melbourne, but open to students from any university doing a placement in central and north-east Victoria, and the Ballarat and Grampians regions. (It doesn't cover medical students.) Take a look at the Going Rural Health website for details. A specific bursary to support Master of Psychology student placements is also available.